Birthdays come and birthdays go. In the blink of an eye we are another year older. With so many memories stored up like treasures that I can look back on, I can smile and be reminded how very blessed I am. 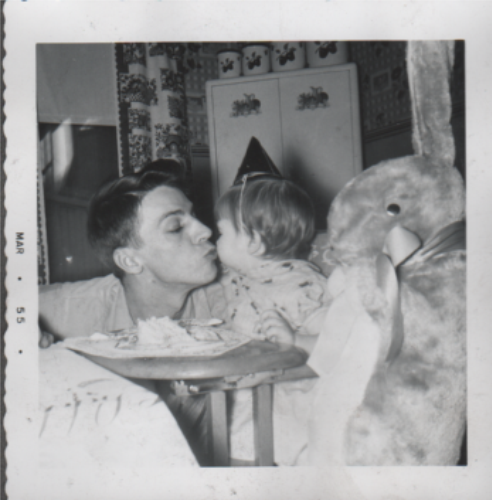 Yesterday was my birthday but I still wanted to share this photo of my dad giving his little girl a Birthday smooch. Dad was always big on kisses up until he left us for his home in heaven. Miss those kisses Dad and look forward to getting another one when we are together again. What a wonderful photo! Happy Birthday!! Happy Birthday..me too, I have a birthday next week. We are only a week apart. I love this picture of you and your Dad a parents love never leave us does it. I hope you had a wonderful day and your birthday was full of sweetness. The snow always looks so pretty but I know its cold.